Before joining the air force, Colin visited for dinner. We had already polished off a couple of pizzas when this one came out of the oven. Colin was quite full but I encouraged him to taste it. Being a good sport, he pushed himself and ate a small corner piece. Then he went for a bigger one. He was bursting, but he had a third and acknowledged that it was a pretty good pizza. A couple of thoughts to keep in mind with this recipe. Using BBQ sauce instead of tomato sauce has a nice flavoring effect, but don’t overdo it or it becomes too sweet. If you cut down on the cheese, more BBQ and chicken flavors come through – its more flavorful and lighter. So you can eat more. Also, the optional lime works better with green onions than chives or red onions. I don’t know why. – Don’t be afraid of over-flavoring this one, they tend to blend. Begin with a pizza crust lightly brushed with olive oil, sprinkled with garlic. Pre-bake at 450 degrees for 3-5 minutes to ensure crisp crust. While crust is baking, stir fry chicken in hot sauce (or, smoky BBQ sauce, or liquid smoke). Season to taste. The idea is to provide a complement to the sweet BBQ sauce on the pizza in the next step. Remove crust from oven and brush with the sweet BBQ sauce. Spread mozzarella on pizza crust, add chicken. Bake at 450 degrees for 12-15 minutes. Spread sesame seeds in small pan and heat on low until brown. Remove pizza from oven and sprinkle with sesame seeds. For the fun of it, squirt a lime on your pizza slice. The Cubans put lime on everything, and it adds a neat twist. All I can Say is a BIG WOW!!!!! Awesome sounding !!!!!!! the chicken itself already sounds very delicious! and now it goes with cheese for a pizza!!!!! totally die for it! Yum. I make BBQ Chicken pizza for the hubby! I have not made pizza for awhile now. ANd next time I will add BBQ sauce instead..
That looks gorgeous and delicious. I love all the ingredients. I don’t really eat pizza but this one just captivates me. Thanks for sharing. I love pizza and homemade is the best, so this idea of bbq chicken on top sounds so good but if I make it I’ll probably change out the sweet bbq for a hot sauce so it would be more like a hot wings type of pizza! 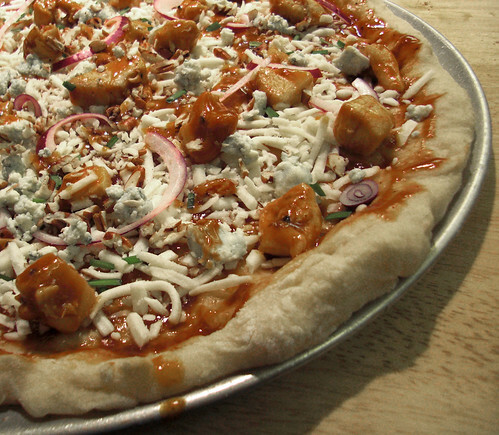 Then that would be buffalo chicken pizza – another delicious treat! I’ve made this pizza before also. My brother loves the BBQ chicken pizza from CPK. I like the liquid smoke and hot sauce idea. In the recipe I used, you put the marinate the cooked chicken in a little BBQ sauce in the frig, so when you cook the pizza, chicken gets extra BBQ flavor crusted onto it. Also, smoked gouda is really delicious on this pizza! Oh my, Red would just love this pizza! I make a similar one and love it. I like the idea of the Louisiana hot sauce! This looks terrific. I’m a fan of CPK’s BBQ chicken pizza and I think this would be even better. BBQ Chicken Pizza is one of my youngest sons favorite things! We just do sweet bbq sauce, jack cheese, red onion and cilantro (lots of both). I am however very intrigued by adding that smoky element to the chicken. Nice touch. I could eat pizza everyday!!!! This is a great alternative to the usual veggies pizza I eat! Thanks for sharing this yummy yummy recipe! !